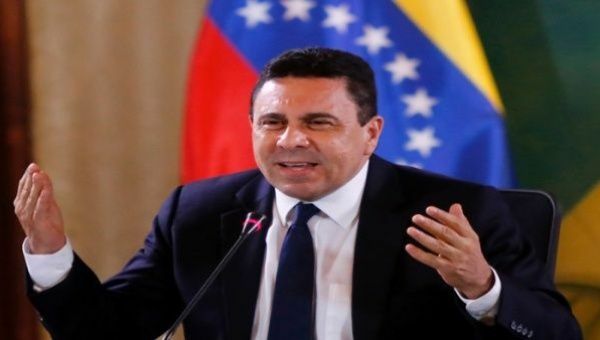 Deputy Minister Samuel Moncada reiterated that the U.S. Government is one of the most aggressive and humiliating in the region. “We do not accept the US as a court or authority of anything, we are free,” Moncada said in a statement to the media. He also reiterated that U.S. President Donald Trump has expressed himself in demeaning terms about some OAS member states and threatened to revoke the Temporary Protected Status Program (TPS). U.S. Vice President Mike Pence on Monday announced new unilateral sanctions against three Venezuelan citizens and some 20 companies for alleged links to drug trafficking and called for the suspension of the upcoming elections. In response, Moncada said that “there is no possibility of the elections being suspended,” a timetable has been successfully fulfilled according to statements made by the directors of the National Electoral Council (CNE). On the other hand, representatives of the Venezuelan opposition sector, Julio Borges and Carlos Vecchio, were present during Pence’s speech and requested more pressure be used against the election in Venezuela.